"For centuries, the city – and its legendary West Lake in particular – has inspired writers, philosophers and poets," said the design team. "Harbook continues this legacy, expanding the city's literary culture to include nods to European traditions, yet with a progressive contemporary approach." 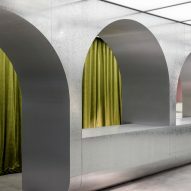 The store's contemporary-meets-traditional concept is reflected in the interior design, which the designers said was inspired by an "imaginary cityscape" theme. 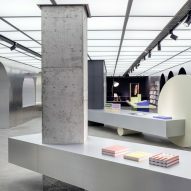 The geometric forms, and largely silver and pink colour palette mixed with accents of bright colour, lend the interior a postmodern edge that offsets the store's more classical elements. 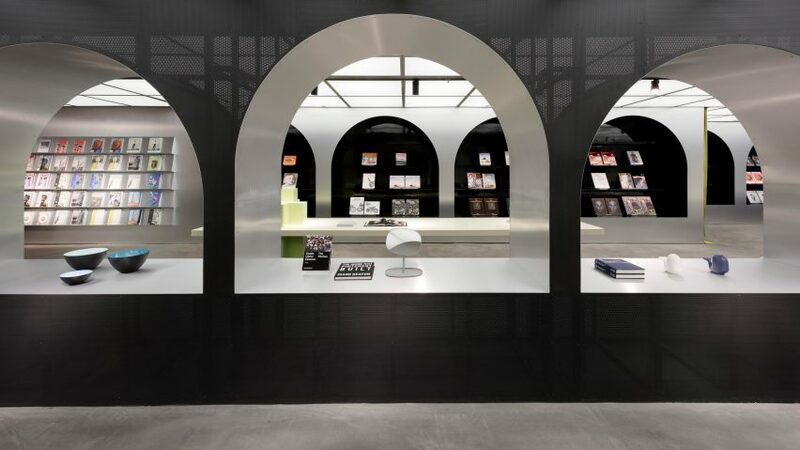 "Thematically connecting Harbook's urban elements of socialising, cultural exchange, shopping and dining, these design elements create a quite literally immersive dialogue between eras and cultures, providing a sensual journey through the space," added the designers. Overlooking the city's West Lake, the cafe features a floor made of traditional, locally-sourced Chinese bricks that pay homage to the bookshop's location. The architects said the cafe is intended as a "dream-like" space where customers can meet with friends, work, or read. 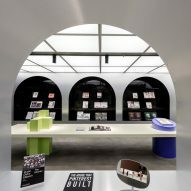 Other retail projects that blend book shops with other lifestyle activities include Klein Dytham Architecture's sprawling "village" of shops in Bangkok, Thailand.